Louis Pasteur was a French chemist who made a lot of contributions to medicine, chemistry and industry that greatly benefited humanity. His discovery that bacteria spread diseases has saved countless lives. He is one of the most extraordinary scientists in history, leaving a legacy of scientific contributions that led him to be called the founder of microbiology. Louis Pasteur was born in 1822 in Dole, France. He had a very normal student life and was noted for his great skills in the arts, especially with painting and drawing. Though Pasteur was not very good in his studies, he was a hardworking and conscientious student. Spurred by his teachers’ encouragement, Louis Pasteur undertook rigorous efforts to study hard to get into college at the Ecole Normale Superieure. There he earned his doctorate degree in the year 1847. After teaching and researching for a year in Dijon Lycee, Louis became a professor of chemistry at Strasbourg University in 1848. This is where he met his wife, Marie Larent, who was the daughter of the university’s rector. They were married in 1849 and had five children, but only two survived childhood. When Louis started working at the University of Strasbourg, he began to study about fermentation, the process of breaking organic materials using microorganisms. In 1854, Pasteur joined became a chemistry faculty member in Lille. Here he launched his studies on fermentation. At that time period, many scientists believed that fermentation occurred spontaneously by a series of chemical reactions, where enzymes played a crucial role. 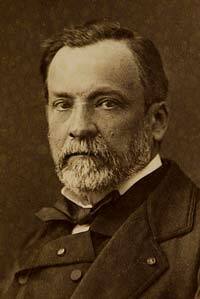 Pasteur, however, believed that fermentation was carried out by living microorganisms. In Lille, Louis was able to demonstrate that micro-organisms were responsible for the souring of beer and wine. He showed that the same microbes could be removed by a process called pasteurization, which involves boiling and cooling the liquid immediately. He later extended his studies into milk as well. Pasteur also proved that these microorganisms that are responsible for the souring of wine, beer, and milk were naturally introduced from the environment. In 1857, Pasteur joined as a director of scientific studies at Ecole Normale. Here he continued to study the fermentation process. He was asked by the silk industry in France to help them when there was an epidemic among the silkworms. Even without any prior experience, Pasteur identified the cause of the infection and saved the silk industry. Pasteur proved that various diseases in the human body were caused by micro-organisms that multiply in the body. He also found that, if such microbes are weakened and kept in the animal’s body, it creates resistance to the microbe. This method of fighting off microbes was called vaccination. In 1868, Louis suffered a stroke that left him partially paralyzed. Despite his paralysis, Louis continued to do his research. His first vaccine for a disease called chicken cholera was discovered in 1879. He then went further to create other vaccines for anthrax, tuberculosis, small pox, and cholera. He then focused his effort to develop a vaccine for rabies in 1882. The rabies vaccine developed by Louis brought him immediate fame, which led to the set up of an international fundraising campaign for to construct the Pasteur Institute in Paris. Louis died on September 28th, 1895. His remains were transferred in 1896 to a crypt in the Pasteur Institute.